At St George’s we firmly believe that learning a foreign language not only broadens horizons and fosters a better understanding between people of different cultures, but it also enhances our pupils’ academic potential through the development of critical thought, creative imagination and problem-solving skills. Our pupils have the opportunity to learn modern languages in a lively, stimulating way which promotes enthusiasm and the ability to communicate effectively. French is taught from the Nursery upwards with lessons increasing in number for the older year groups. Spanish is introduced in Year 6 and is offered as a conversational subject for those pupils who wish to continue in Years 7 and 8. 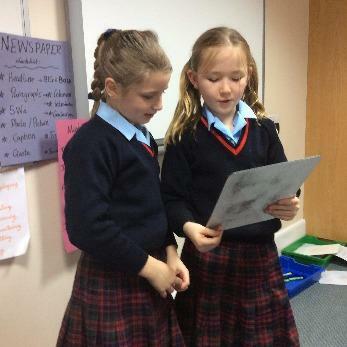 In Years 4, 5 and 6 pupils have the option of learning German as a co-curricular activity after school. Classwork consists of oral work, including pair or group work, role play, songs, games, listening exercises, reading, comprehension, grammar exercises and written pieces of work. These formal teaching methods are complemented by the use of technology in various forms to give our pupils a fun and effective way to increase their vocabulary and understanding. Our pupils’ appreciation of French and Spanish culture and customs is enhanced by the use of a variety of media including magazines, DVDs, TV programmes and events such as food tasting and language plays performed in the school by visiting theatre companies. In Year 6 our pupils have the opportunity to join a French study trip to Méluzien near Dijon, which is always thoroughly enjoyed by the pupils. Latin begins at St George’s in Year 5 and continues through to Year 8 with an increasing curriculum entitlement. It is a broad subject encapsulating the study of an entire culture – crossing the boundaries of History, Geography, Language, Religion and even Art and Maths, stimulating in young children an inquiring mind. Alongside mastering the vocabulary and grammar of the language required for Common Entrance, classical topics such as Greek mythology and the entertainments of the City of Rome are also studied. We woke up at 5am and sleepily made our way to school.The day of the French trip had arrived! There were emotional scenes as parents said goodbye to their children and everyone boarded the coach to head for the Tunnel and then on to France. After a long and tiring journey we arrived at Maison Claire Fontaine, a school set up for French studies and other activities, in Meluzien, Burgundy. We all found our dorm, unpacked and headed to an outside area to either play baby foot (table football) or go on the swings. The next morning we soon found out how much French we would have to speak because at breakfast we had to ask for our meal in French. We even had to know the words for the cutlery. This was hard at first, but we soon got used to it and did not worry after a while. Each day started with French studies in a classroom to help prepare for the day ahead and speaking French. We spoke a lot (in French!) and the teachers were kind and helpful. If we got stuck, they helped by speaking English, which made us less nervous. After that there were lots of activities, such as circus training, archery, French cuisine, mosaic making and everbody’s favourite, tree adventure. As well as these activities, we performed in a concert in a local church in front of reach French people. Some children had piano or singing solos and the concert was a great success. We joined with some French children and sang several songs together, both in French and English. One evening we visited a French restaurant. We sat on separate tables and practised our French by ordering a meal without using a word of English. This was fun and went better than we all expected! The trip ended with a disco to celebrate a successful week and we all had a wonderful time. If you are going on the French trip next year, you are in for a treat. Year 6 would like to thank all the teachers for giving up their time in order to make wonderful memories for the children. We learnt a lot and had fun. Merci bien! On Monday 15th January, Years 5 and 6 watched a French show called “Le Château”. There was a French actress who played a French peasant, and an English actor who played the mightly British noble, William Babbington. It was set in the Tudor times. William is on a quest to find a wife for King Henry VIII of England. Jane Seymour has died and Henry wants a 4th wife! Some of the best parts of the show were at the beginning of the play, when the French actress was speaking complicated French and the male actor kept on shouting from behind the set, telling her to slow right down. When William got into the castle, Catherine tried to hit him out of the window with a broom! There were many more funny things, but I don’t want to give them away. I would love to see more shows like it.